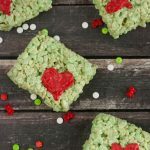 What better rice krispie treats to have for Christmas than Grinch Rice Krispie Treats! I love watching How The Grinch Stole Christmas during the holiday season. The boys also enjoy the movie so I decided to make some delicious treats for a movie night. The recipe for these treats is based off my Best Rice Krispie Treat recipe. The recipe makes delicious and gooey rice krispie treats. 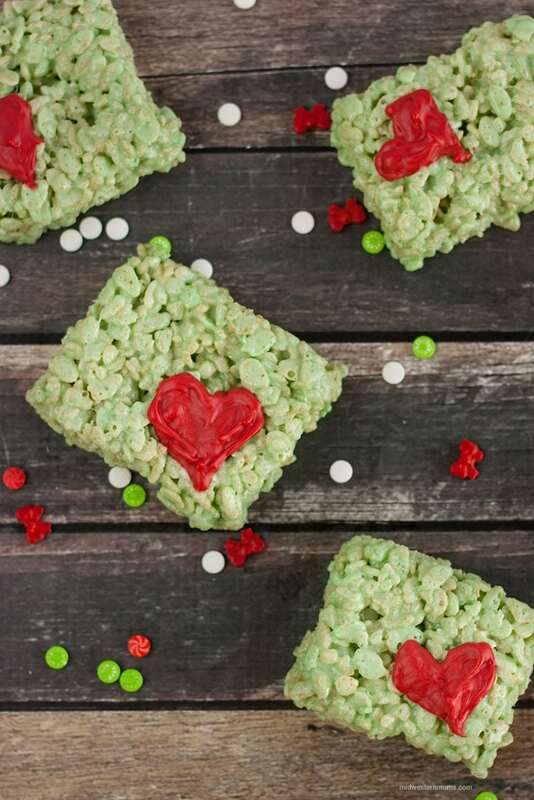 Turning the treats green and adding a red heart reminds me of the Grinch’s heart and how it grew at the end of the movie. A simple way to resemble the movie for movie night. A 16 oz bag of Mini Marshmallows is equal to 8 cups. Before starting, measure out 2 cups of marshmallows to prepare. Use non-stick cooking spray generously. Spray your dish, the spatula, or fingers. If it touches the treats once they are made, make sure it doesn’t get sticky by the rice krispie treats by spraying with non-stick spray. Use disposable icing bags for the candy melts. This way you can heat the candy melts in the bag according to the directions, use, and toss. It makes for easy cleanup. Just snip the end when ready and pipe on the hearts. If you want more ideas for the holiday season, check out these Christmas Rice Krispie Treats. Simple treats to make for a movie night! 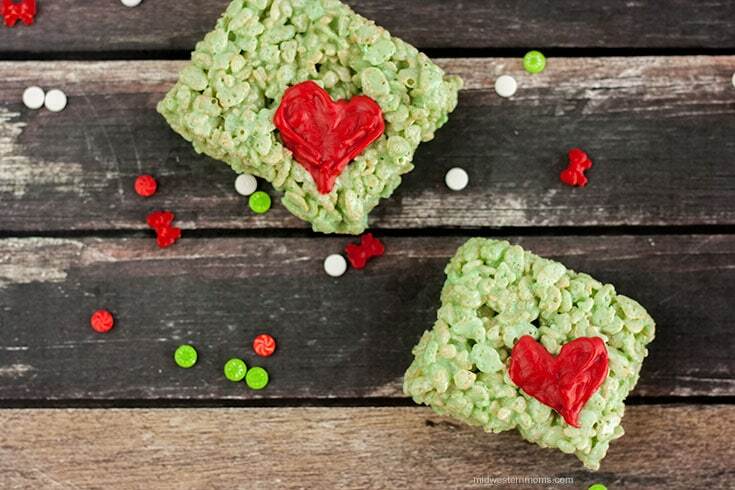 Delicious and gooey Grinch themed Rice Krispie Treats! Perfect for How The Grinch Stole Christmas movie night. Add the food coloring. Adjust amount to your taste. Dump into an 9 x 13 greased dish. Use a greased spatula to spread out the treats and press down. Melt the red candy melts in a disposable bag in the microwave according to instructions. Pipe hearts onto each treat. Once the candy melts have harden, serve. The amount of treats will depend on how you cut your treats.